To say that Tom Newby School is passionate about cricket is a gross understatement. The coaches and players who participate in this extra-mural activity live, breathe and dream about bats, pitches and wickets. They participate in Smart Sport cricket, they practise in the afternoons, they practise over weekends and if that is not enough, they attend coaching clinics during the school holidays. This enthusiasm culminated in an international cricket team visiting and competing against some prestigious schools in the United Kingdom in 2013 and plans are afoot to embark on another tour in 2017. Many of our cricketers have qualified for bursaries at local school because of the contribution they are able to make to the High School Cricket programmes. 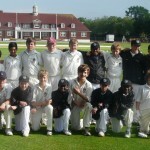 Cricket is offered to three age groups of players: U9, U11 and U13. Only one team, per age group, is entered into the league. Development of cricket skills takes place through the Smart Sport Programme and players are encouraged to develop their proficiency levels if they would like to be included in an official league team. Smart Sport cricket takes place in Term 2 and a cricket coaching academy is offered, on Friday afternoons, throughout the year, at no cost to the players. The cricket league season takes place in Term 3. Please consult the term schedule for practice times and match dates. All cricket practices take place on school premises. All cricket matches are played at off-site venues. The school is able to provide transport to off-site venues if required. Cricket practice uniform is the TNS PT kit. For matches, players must purchase their own white trousers and a white TNS golf shirt. The school is able to provide bats, pads, helmets and gloves to players but it is advisable for players to own personal equipment that will put them in a position to play to the best of their ability.